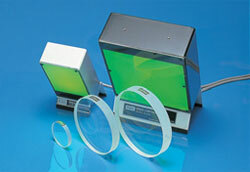 The Hyprez® FMD lamp is the most advanced flatness measurement device, replacing a conventional helium lamp. A green light (wavelength: 5,461 Å) backs up the optical flat to clearly indicate a fringe pattern on a mirror surface. Also, it can take a clear photograph of the fringe pattern with ASA400 film. ※All power is single-phase 100 V.
※The flatness accuracy is available in two types: 0.2 µm and 0.05 µm. ※The optical flat in other size and other flatness accuracy will be separately quoted and manufactured upon request.